Northern Territory taxpayers are facing a looming budgetary crisis as costs for managing dangerous weed gamba grass skyrocket, according to a new report. The Counting The Cost: Economic impacts of gamba grass in the Northern Territory report, released by the Gamba Grass Roots action group, highlights unprecedented escalation in the costs of weed and fire management since gamba started spreading across the Top End. These increasing costs of standby firefighting capacity, along with the expense of fighting the more intense fires, could potentially result in millions of dollars of additional expenditure per annum if gamba grass infestations are not extensively controlled. Gamba grass fuels far more intense fires than the typical native grass fires seen in the Top End. Fuel loads in gamba-infested areas are 4 to 10 times higher than those carried by native grasses. Gamba grass fires can be up to 12 times more intense than native grass fires. 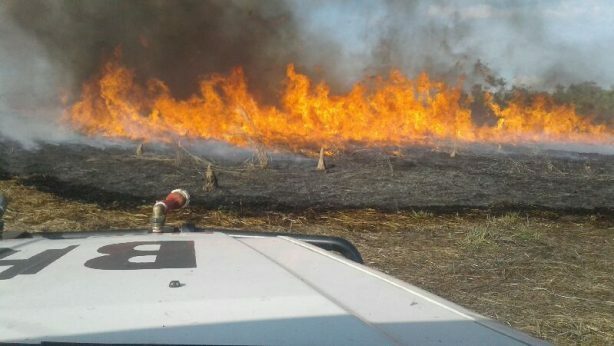 Being prepared for such intense fires is costly in comparison to the Top End’s typical native grass fires, as firefighters in gamba-infested areas such as Batchelor and Darwin have had to introduce new and expensive fire management measures. The report also illustrates lost opportunities in the growing carbon sector. The presence of gamba grass in a carbon project area results in lost income due to the work in managing the spread of the weed and ensuring that intense gamba-fuelled fires don’t jeopardise carbon credits and reduce the viability of carbon farming opportunities. “What we’re seeing is an incredible spike in the costs of gamba to the Northern Territory taxpayer since the weed started spreading across the Top End. “Gamba grass is an unprecedented challenge for the Territory community and our Government now needs to respond accordingly. “High-intensity fires caused by gamba grass infestations have sent firefighting costs skyrocketing, while also putting lives at threat and seriously damaging the Top End savanna landscape. “It’s not only the cost of fighting the fires and managing the weed, but the Territory is now facing the very real risk of missing out on millions of dollars through the growing carbon industry. “This is a strong, growing industry that’s could generate income of over $100 million annually in the future. Gamba Grass was introduced in the 1930s as cattle feed and is now one of 32 weeds of national significance. Up to 1.5 million hectares of the Northern Territory are currently infested with gamba grass, with estimates that the weed may spread up to 38 million hectares if efforts to contain and control it fail. In the Vernon fire management area, which includes Batchelor and Darwin, the daily cost of equipment required to be on standby to respond to fires has increased by 30 times, from $474 a day in 2007 to between $15,000 to $18,000 a day in 2018. Carbon farming is worth tens of millions of dollars annually to the Northern Territory, and has important social, cultural and environmental benefits for many remote communities. In the 2017/18 financial year, Indigenous carbon businesses generated around $11.2million in carbon credits in the Northern Territory. Gamba Grass Roots is an alliance of The Pew Charitable Trusts and Environment Centre Northern Territory.